Air Claire got busted again with her private plane. The Obama Democrat told Missourians she was taking a bus tour of the Show Me State. She didn’t tell them she was ditching the bus for her private plane during many of the stops. She thought she’d get away with it. Sen. Claire McCaskill (D., Mo.) said her campaign was “hitting the road” in an RV to tour the state, but public flight information indicates that travel also occurred on her million-dollar private plane. 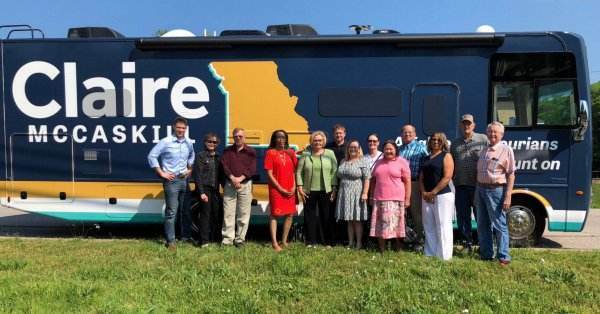 The RV, named BigBlue by the campaign, was unveiled late last month by McCaskill, who said she was “very excited to hit the road” in it for an upcoming “Veterans for Claire” tour. The campaign kept a live blog of its three-day RV trip from May 29 to May 31, posting updates of its whereabouts. Unmentioned on the blog is the role McCaskill’s private plane played on the trip. The aircraft is a single-engine turboprop valued on her financial disclosure forms at more than $1 million dollars. McCaskill has taken steps to hide the use of her plane. In a 2017 email obtained by the Washington Free Beacon, the senator asked the Federal Aviation Administration to block radar tracking information on her plane from being publicly broadcast on the internet. The request blocks the ability to track her plane on websites such as FlightAware.com. On Wednesday President Trump slammed Claire McCaskill for cheating on her RV tour of Missouri.